We have never had 3 cancellations in 3 weeks before!!! Due to serious injury a week is available on our lovely 8 berth Dufour 36 – ‘Shadowfax’ – 3rd – 10th May. Email or phone 01631 565630. Oceanlord refurb. almost complete !! Over the winter we decided to refurbish Oceanlord. Every single panel of the interior headlining has been removed – the insides of the hull sanded flat, every panel replaced and reupholstered and refitted. Whilst she was disassembled we replaced most of the wiring and updated the lighting to modern LED lighting. Every hatch and window was removed and either refurbished or replaced and then re-bedded to ensure a leak free boat before reinstalling all the new panels and new fabric upholstery. If you have booked a week on Oceanlord this year we are sure you will be absolutely delighted with her. If you haven’t booked a week yet then there are one or two early and late season weeks still available. 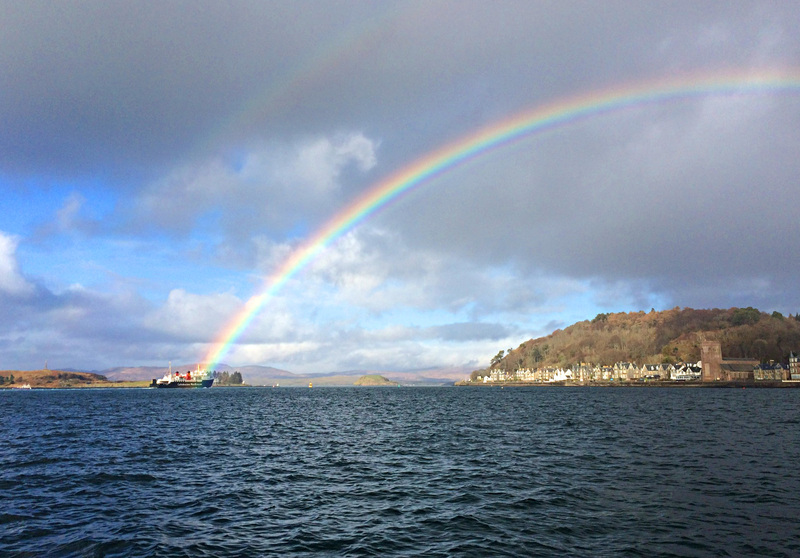 Every CalMac ferry comes with its own pot of gold! Well this one did !!! 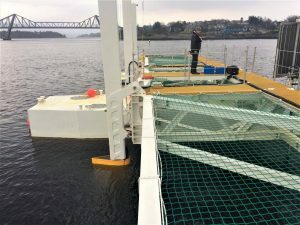 The new transit Marina in Oban Bay is now open for business – a great place to stop off for a spot of shopping or a meal ashore. It also makesd an ideal place to stop the night before returning here as its just a short hop away. Full details here. We completed one of our more unusual requests today! 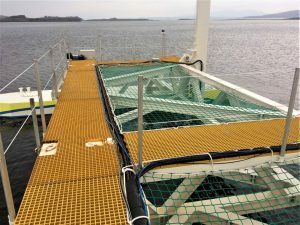 There is a prototype tidal power electricity generating platform being tested in the Falls of Lora and we were asked to make guard wires and safety lines for it to prevent visitors falling in the drink. The quote was submitted on Weds, order placed for all the swaged fittings on Thursday – parts arrived Friday (Big Thank You to the boys at Sta-Lok rigging!) – Tim and I made all the parts on Friday from our detailed measurements and on Saturday we fitted all the wires. We were VERY pleased that every wire was the right length – first time ! 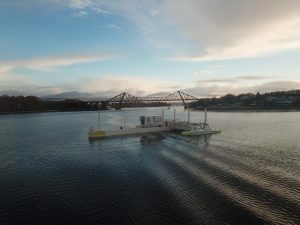 It looks great and we were very pleased to be able to help out the company behind the project – the whole setup will eventually be dismantled after testing and shipped out to South East Asia where it will be permanently installed. More information about this interesting project is here.